This is (I think) the correct way of doing what I tried to do with an extension. My objective was to reduce a bit the size of the gnome shell top bar, and especially the font size. 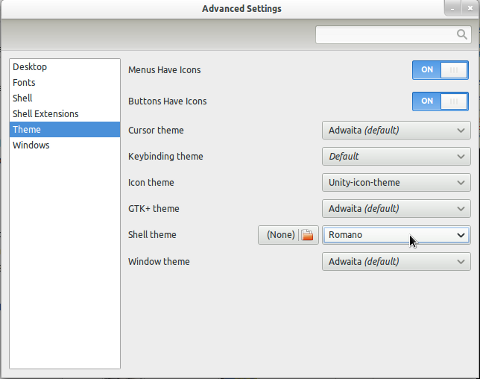 The important line is the first, which loads the standard gnome-shell theme, and then the theme proceeds with modifying the font sizes and attributes. In this case, it set the font smaller, it reduces the space between buttons and indicators, and then changes the color when hovering atop the buttons with the mouse. grey bar appears between the (reduced) top panel and the desktop background. Any suggestion to solve this? change the desktop background back to the default one but no luck. Anyway, it’s a minor issue, thank you for the suggestion. Thanks for your post, I’ve recently followed the same thought process as you (“let’s make an extension! oh..a theme modification is more appropriate”). However, what if you wanted to use one of the inbuilt themes (like Dark-Glass) as well as your modification? Can you use more than one theme at a time? I really have never tried this. I suppose that modifying the “include” line would let you use as a different base theme — but I did not try it.